Music is food for the soul, Adrenaline is the fourteenth dose of caffeine to it! From the literature fests where literature lovers throng to the Lone Wolf Quizzes at the IITs where those solitary proud scholars meet for a face to face; to music fests where all who share a love for melody meet, we have seen it ALL. Or so we thought, until amazing brains came together with something new, something thrilling and something that's going to give your soul that fourteenth dose of caffeine! They bring to 200 colleges of Bengaluru, a BRAND NEW concept, a fest of whose likes has never happened before, which is solely and dedicatedly for all those adventure junkies that sit in the classrooms of today! 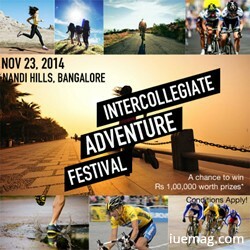 Your wish for having a fest where adventure and adrenaline is the theme has come true, your wait has ended, here's presenting "The Intercollegiate Adventure Festival"! So what are you waiting for? Get yourselves registered right away! Get set for the first big adventure fest of Bengaluru with strong gear and a stronger heart, for (in Bon Jovi's words) this ain't a song for the broken hearted!!! Any facts, figures or references stated here are made by the author & don't reflect the endorsement of iU at all times unless otherwise drafted by official staff at iU. This article was first published here on 13th October 2014.